What does ”Red Tape“ mean to an average small entrepreneur? Now entrepreneurs of Slovakia, Bulgaria, and the Czech Republic know the numbers! Organizing the means of production so as to provide an added value for the market is a challenging activity full of risks. An entrepreneur must daily contend with the changing needs of customers, competitors, suppliers, or with destructive effect of innovations on his business. Any additional obstacles from the state cause deceleration and sometimes even end of such an endeavor. There are several existing competitiveness rankings around, which comprehensively assess the quality of law enforcement, infrastructure, and tax law from a business perspective. However, these are often focused on the macro picture and not easily translate into the daily life of a small entrepreneur. In 2016, the Institute of Economic and Social Studies (INESS) from Slovakia decided to fill the gap and theBureaucracy Index was born. In collaboration with experts from different areas, INESS identified and analyzed all the administrative tasks that the state requires from a model SME company. These tasks were assigned time and financial demands. At the end, the public learned the time, the number of duties, and the monetary representation of the costs of bureaucracy. The Bureaucracy Index was partnered by several major industrial associations and the response from media and fans was astonishing. The press conference attracted all national media and the subsequent stunt in the streets of Bratislava (when pedestrians were rewarded for guessing right the size of the complete Bureaucratic Folder) directly involved public. To call more attention to the bureaucratic burden, September 29 was established as the International Bureaucracy Day. Thanks to the support from the Friedrich Naumann Foundation, INESS was not only able to repeat the calculations in 2017, but was also joined by Bulgarian partners from Institute for Market Economics and Czech partners from Liberal Institute. 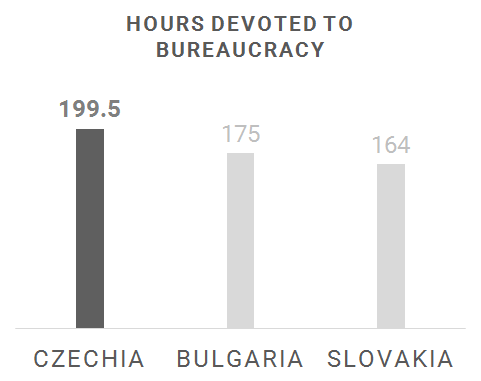 The micro-ranking revealed that the most time-consuming bureaucracy is in the Czech Republic. The ambition is to grow further and involve more partners in 2018. Should your institute have interest to join, please contact the project coordinator at top20@iness.sk!